Eggplant can be tricky to cook with, don’t you agree? You can only make Eggplant Parmesan so many times! This recipe led me to a whole nother way of thinking about eggplants… you’ve heard of Kale Chips, well, enter Eggplant Chips! In a large skillet, heat 1 tsp olive oil over medium high heat. Saute peppers and garlic until peppers are tender. Add lemon juice and salt and pepper to taste. Set aside, but keep warm. Turn on broiler. Rinse fish and pat dry. Season fish with salt and pepper and place, skin side down, on a sturdy baking pan. Drizzle fish with remaining olive oil. Cut eggplant (skin on) into very slender 1/8 inch slices – using a mandolin is even better! 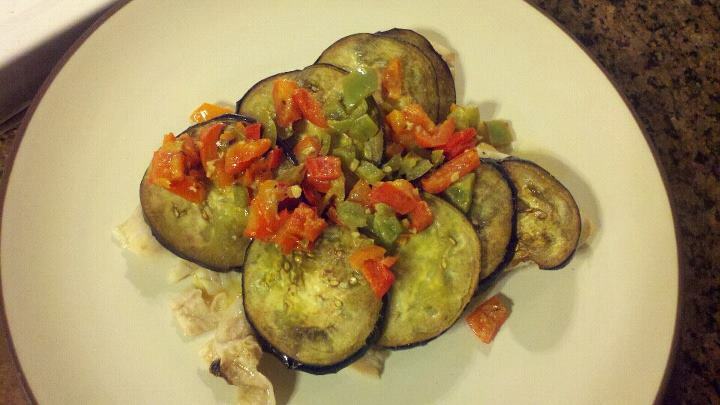 Layer eggplant slices over fish. Place pan under broiler until fish is cooked through. Remove from oven and cover with Bell Pepper Sauce. Serve warm with green beans and a glass of white wine! 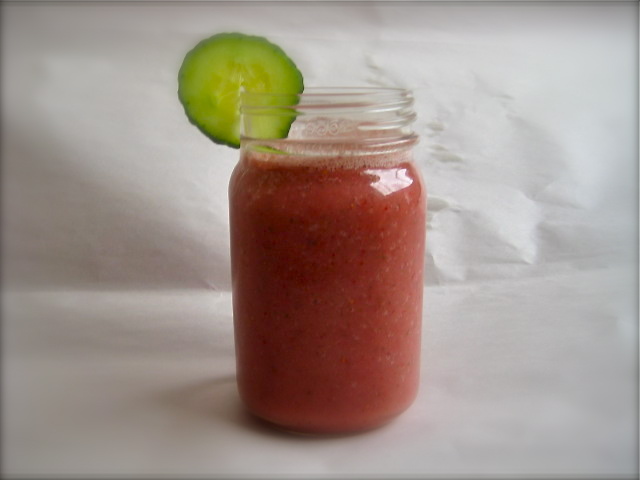 On a hot July afternoon, there is nothing better than a smoothie packed with ice cold fruity goodness! This is an excellent way to put those tasty CSA cucumbers to good use. If, in fact, you can refrain dipping them in hummus! Toss everything in a blender and blend till blended! Enjoy on your front porch or back deck or tree house or side yard or sidewalk or, ya know, somewhere outside. Thank you for signing up for our Organic Egg Shares! We look forward to working with you beginning in May. Watch your email for more details. While you’re here check out our produce information, our blog, or find more information about our vegetable CSA.